As an early adopter of the micro-subletting culture — the founders of Airbnb invited me to join the service as it was just starting up back in 2008 — I fancy myself somewhat of an expert in successfully turning a home into a rental property. Six years in, I've not only made one home a major profit center by sharing my rooms with travelers, but now two — the latter of which is a direct result of the success of the first. My husband and I were able to purchase a second property with the income we've earned from renting our primary residence. 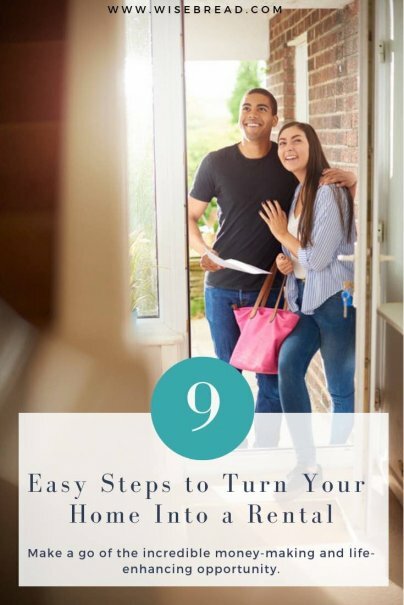 Based on my own experience, here are nine essential line items you should check off if you plan to make a go of the incredible money-making and life-enhancing opportunity of turning your home into a rental property. My primary residence is in Manhattan, and the never-ending influx of tourists is what gave me the idea to market my guest bedroom as a hotel alternative many years ago. I didn't have to do much research to realize that there was a built-in business in my area for what I wanted to do, but as you can imagine that doesn't apply to all areas. Most areas, in fact, don't have the attractiveness to tourists that New York City does. That doesn't mean, however, that you can't become a homegrown entrepreneur in the comfort of your own living room. Because of the popularity of Airbnb, Roomorama, HomeAway, and other short-term rental sites, an increasing number of rooms are now available to budget travelers nearly everywhere. Thus, your first step in turning your home into a rental property is digging into these sites to see who in your area is listing their property, how full their calendars are with bookings, and to generally peruse their listings to see how they're managing their own burgeoning businesses. You'll get a good sense of what you can expect in terms of traffic to your listing and potential bookings. On another note, if there are currently no listings in your area, don't get discouraged. That could mean that you're getting in on the ground level of an untapped market — and you'll never know its potential if you don't test the waters. I didn't have any idea what I was doing when I first started renting my property — this was a brand new venture for me — so my first year or so was completely trial and error. You have an advantage, however, because micro-subletting has and continues to increase in popularity, so you're bound to know at least one person who's tried their hand at it. You don't have to stick to micro-subletters though; reach out to anyone who's in the rental-income game and ask to pick their brain about the ins and outs, highs and lows of their business. You'll gain valuable knowledge that can positively influence your own new endeavor, and you may even be able to avoid some roadblocks along the way by learning from their mistakes. One of the biggest factors in a potential guest's decision on whether to stay at your property will be how it looks. It's a decision-making process as old as time — we pick out food, cars, and romantic partners based on their physical attractiveness — so it only makes sense that that theory applies to where people want to lie their heads at night. Especially in a stranger's home. Considering this superficial factor then, it's important that your rental listing images stand out from the crowd. Photos should show a space that is inviting, comfortable, and clean — all critical components to ensuring that your room or home is near the top of the list when potential guests are choosing where to stay. If you use Airbnb, consider using its free photography to enhance your listing, which, I can tell you from experience, will truly take yours to the next level — considering that your home is already someplace that looks visitor-friendly, of course. If your home isn't immediately traveler-friendly, that's okay; you can change that. The first plan of attack in this instance is to do a deep clean (which, by the way, is beneficial in more ways than just preparing it to be a rental property — there's money to be made in selling your clutter!) to get rid of anything that's unnecessary, safely store away items of sentiment or extreme value, and otherwise organize your belongings in an aesthetically pleasing and unobtrusive fashion. Having a well-kept and well-organized home will be easier on you when it comes time to clean between tenants, and the results will show in photos and the reviews your guests will leave you. Another critical part of making your listing a major contender among potential guests' choices is the amenities you offer. It's all wrapped into the per-night fee that I'm charging, of course, but to them it looks like they're getting something extra for free — and often that means that they're choosing my place over someone else's. While I don't recommend that you run your business like a hotel — a more personal touch is always required in this person-to-person rental situation — I do suggest that you take your cue on what you're offering guests as a value proposition from hotels. In my guest bedrooms, I include fresh linens and towels, high-def flat-screen HDTVs, mini-fridges, and coffee makers, and I provide the guests will free cereal, fruit, coffee, and tea. These are little things that go a long way in a guest's decision on where to stay, especially if they're budget minded. I've already alluded to this aspect of successfully turning your home into a rental property, but in case you've missed it, listing your property online is the best way to drive a lot of traffic to your property. Airbnb, Roomorama, and HomeAway are the major players in this game, but there are other sites on which you can list to really corner the market. If you want to go all out, look into similar sites like VRBO, Misterbnb, Furnished Quarters, and Sublet.com. For the most part, your listings will market themselves on these sites, but you need to stay on top of your inquiries, keep your listings up to date, and promote them on social media and offline to maximize their efficacy. I didn't go to business school, but I've learned a thing or two about good business by being an accidental entrepreneur: If you want to make money, you have to offer the best product at the most reasonable price. That business model has never failed. That's how I've run my rental-property business since the beginning, and that's one of the main reasons why I'm booked nearly 365 days a year. My strategy is to research the comparable listings in my area on the sites on which I'm listed and set my price for my more attractive listing below their nightly fee. As a result, my calendar is consistently full while theirs has gaping holes. I wonder if that qualifies for an honorary business degree? I should call my alma mater. When your bookings start to pile up, it's easy to get overwhelmed — which is why you need to set up organizational procedures to ensure that your business is streamlined and runs efficiently. Keeping your calendar up-to-date is number one on this checklist — you don't want to overbook guests who will have no place to go if you can't accommodate them because of your error. Organizing your cleaning protocol so you can breeze through the house and prepare for new guests quickly is a close second to an organized calendar. You should not be lax about either one of these organizational aspects for many reasons, the most important of which is that you owe it to your paying guests to be professional and prepared at all times. In order for any business to succeed for the long term, it must evolve and keep up with industry and social trends — and your small rental-property business is no different. Because micro-subletting is a relatively new concept, local laws are changing rapidly to ensure that taxes are being paid and safety measures are put in place. Cities like San Francisco have made micro-subletting legal while New York City is still entrenched in litigation to determine how best to manage the growing trend. Newsletters and other correspondences from the services on which you list are great resources as is talking to your fellow rental-property entrepreneurs about their experiences. I also can personally recommend the Overseas Property Insider Podcast from my buddy Taylor White, which offers insider information into the vacation rental industry on a regular basis. Do you have a rental income property? Do you have tips to share with us on how others can turn their homes into profit centers? Please share in comments! I wonder if you are aware that what you're doing is illegal in New York City. For me it isn't actually. I own my home, I'm not a renter. In any type of rental, market research is key. Also, in this age of the internet, I like the fact that you focus on "Visually Stunning Destination". I remember staying at an apartment on my first trip to New York. The owner of that rental could have learned a lot from your article.